That's what's up for debate here. At least if we change "universally shared" to "commonly shared" or something more reasonable. But it can close the gap between a vegan with a seemingly religious approach to food and someone reasonable. And at least one poster suggested that agriculture was an insignificant contribution to total greenhouse gas emissions, concluding that focusing on diet as a part of controlling climate change simply doesn't make sense. The data in the post you responded to suggests otherwise, it suggests that dietary changes on a large enough scale could have a significant impact on the problem. I don't think this thread is about heaping guilt on people's dietary choices (I could be wrong), I think it's about one more avenue from which to approach the problem of climate change. Higher carbon footprint per pound? per calorie? I don't doubt the statistic, I'm just trying to understand the metric being used. I don't know about better necessarily, but I think that would be reasonable, though it would likely be more complicated to implement. We all do a lot of things that contribute to climate change. Right now I have the heat on in my apartment. None of us is likely to be able to live a carbon neutral existence and I don't think anyone here is saying we should all just kill ourselves in order to stop producing greenhouse gas emissions. But each of the things we do has different costs and benefits and we can, both as a society and as individuals, weigh those costs and benefits and try to find the most efficient way to limit our impact. That balance is probably different from person to person, because we all have different preferences, and some changes will be easier for one person than another. In that context it makes sense to bring each possible solution in to the discussion. I think the point is that you can have rational discussions about what you should do with bees only after you accept some set of moral axioms about bees. And accepting moral axioms is not - cannot be - a rational act. And my point is that most people, vegans included, start from the same moral axioms but have reached different conclusions. So bringing up that the axioms impact the conclusions doesn't present a problem. If you'd like to argue that they don't share the same moral axioms, that's fine, but certainly hasn't been demonstrated in this thread. We can reason about the ethics of beekeeping from veganism, but we can't reason about the ethics of adopting veganism. Veganism isn't the set of axioms. It's the set of conclusions (some faulty in my opinion) reached based on axioms that are very commonly held. Follow any moral axiom far enough and you'll find farce. We are omnivores of ethics as well as diet. I'm a vegan--my bias would not be in favor of an ovo-lacto vegetarian diet. Anyway, this is typically disingenuous. If meat is a better source of protein than plants, and eggs are a better source of protein than meat, then this is not an argument that meat is good for you. Meat would then offer nothing beyond what you can get with eggs and plants (beyond heart disease and cancer). This is just another face plant in a long line of face plants. Correct me - with strong evidence - if I am wrong, but red meat is one of the best and most efficient sources of iron in humans. We had a vegan in our corridor in first year Uni. Apparently he had been that way for some time. I always remember him as sallow and unimpressive and coincidentally, only yesterday, I found a group photo with him in it. If you didn't know you'd assume he was the father of one of my mates. He was only 23 and he looked like a chain-smoking 50 year old. If it weren't for the fact we used to sneak mince into his vegetative broths he probably wouldn't have made it to graduation. I'm really glad you posted this, because this has also been my experience. The thing they had in common was a vegan diet. It's been a classic joke, since forever, that health food store workers always look like death warmed up. I find it interesting that if you tie nutrition into climate change the topic explodes..
Not so much if you just talk about obesity, type 2 diabetes and a lot of other things that are killing us from a dietary standpoint. Amazing how we throw out the ideas of "confirmation bias" and "anecdotes are not evidence" as well (let's set aside assessing people by looking at them). Overall, the data suggest that the health of Western vegetarians is good and similar to that of comparable non-vegetarians. It is the position of the American Dietetic Association that appropriately planned vegetarian diets, including total vegetarian or vegan diets, are healthful, nutritionally adequate, and may provide health benefits in the prevention and treatment of certain diseases. This is true because it is heme iron which is more absorbable. This is not a problem though because a vegetarian gets plenty of iron from plant sources like spinach and legumes and, since they eat a lot of fruit and veggies, they also get a lot of Vitamin C which aids iron absorption. In my view, the fact that red meat iron is more easily absorbed is overcome by the studies linking red meat to heart disease and cancer. A balanced plant based diet gets plenty of protein, iron and all other essential nutrients without the same risks as a meat based diet. It's the vegan aspect, not climate change. Plus, you can stave off starvation by eating red meat. Red meat can literally save your life. All meat can, and vegans have no answer to that. I notice the conflation of vegetarian diets (which contain fish, eggs and dairy) with vegan diets which do not. I was merely adding my assertion of how unhealthy vegans seem to be to the earlier assertion of how healthy vegans seem to be. I notice the first source is titled "Health effects of vegetarian and vegan diets". It included vegans as a sub-class of vegetarians. Last edited by Tsukasa Buddha; 15th December 2018 at 06:24 PM. Start a topic about the vegan aspect and nutritional considerations, and see if you get six pages in two days.. While I have little doubt that there are people who self-identify as vegetarians who eat fish, they and you are absurd. One of the actual veggie burgers I tried was a pretty good replacement- for the fries. It was one of those "not supposed to be imitation meat" patties being marketed to the "not even if it has the texture of meat either" vegans. My own observation (based on eating at a rather large number of brewpubs throughout the US) is that if a place makes its own veggie patties inhouse they're generally pretty good, but if they're using a commercial product it's not worth eating. And while seitan-based meat substitutes have gotten better in recent years I'll take honest vegetables over the substitutes anyday. And the less said about vegan "cheese" the better. Many years ago an Episcopal priest names Robert Farrar Capon published a cookbook/meditation called The Supper of the Lamb in which he stated "Vegetables are good, vegetarianism is bad, as are all -isms". (Veganism was barely heard of back then.) My pet peeve is people who make fun of vegetarians and vegans for not eating meat, then refuse to consume all the edible parts of the animals they eat - but that's a rant for another time. One of the weirdest meat substitutes I've encountered was something trying to pass as a vegan chorizo at a pub in the Netherlands: it was almost but not quite completely unlike any chorizo I'd ever encountered, of either the Spanish or Mexican variety. It was sorta close to a passable pepperoni, if one got the urge to make a vegetarian pizza. 1. No one else was doing it. 2. It was costing a lot for little/no benefit. There are a number of carbon footprint calculators around, and Ccalc from the University of Manchester is a detailed version, lead by Professor Azapagic. There other simpler programs out there, but of course you sacrifice accuracy in doing so. That seems to make the vegetables come off even worse that I thought, since you have to replace 1 kg of beef with a lot more than 1 kg of vegetables. If the goal is to reduce climate harm due to dietary decisions, I think all this talk of veganism is counterproductive. The vegan movement is deeply steeped in moralistic thinking. Like most moral, philosophical movements, infighting and "holier than thou" preening is rampant and is very off-putting to the outsider. This isn't an indictment. If you truly believe that certain actions, like slaughtering animals, is evil, there's not much room for compromise. You can't have a little acceptable animal suffering the same way you can't have a little acceptable human slavery. It's an all or nothing proposition if you frame it in a moral way. This can be seen by the many pointed fights about what constitutes "proper" veganism. The knives really come out when people argue whether honey is acceptable or not, for example. From a climate standpoint, who really cares about a little bit of insect exploitation? This type of moralistic imperative does not really mesh with a climate harm reduction motivation for reducing meat consumption, where even a small concession adopted to a large scale can have great impact. I also find that veganism often comes with a lot of baggage that ranges from annoying to profoundly pseudoscientific. It should come at no surprise that a such a movement is chock full of crunchy hippie-ism. I might want to eat a vegetarian diet, but I don't want to accept all the diet woo that often comes along with it. Anti-GMO hysteria is one such example of woo that often comes attached to the vegan lifestyle. No thanks. I could easily see myself adopting a mostly or all vegetarian diet, as I find the ethical, health, and economic arguments pretty compelling. I don't think I'd ever associate myself closely with the vegan movement though. If the goal is to reduce meat consumption, than it should be labeled as eating less meat, not veganism. Last edited by SuburbanTurkey; 17th December 2018 at 09:15 AM. The knives really come out when people argue whether honey is acceptable or not, for example. From a climate standpoint, who really cares about a little bit of insect exploitation? If you drive up I-5 in California north of Sacramento you go through miles and miles of almond orchards. In early spring you'll see beekeepers taking their hives from orchard to orchard. Without the bees there would be no pollination of the almond blossoms, and without pollination there would be no almonds and without almonds there would be no vegan-beloved almond milk. The honey is just a by-product. Anyway, plain old veganism is old-hat in the very best Woo circles: raw veganism is where you'll find the more-righteous-than-thou crowd these days. This is based on the belief that heating food above a certain temperature destroys "enzymes" (or the mystical Life Force) in the food and somehow makes it unfit nutritionally. Now, it is true that heating alters most foods (and makes them easier to digest), but to be on the same side I always carry my own enzymes around with me - safely stored in my digestive tract - just in case. I think there is a bit of suffering worship among some of these vegan folks. The more unpleasant the diet is, the more virtuous it is. There are plenty of tasty foods that are vegetarian, but many vegans look down on these junk-food vegans for devaluing the brand. My wife doesn't fit that description at all. We eat tasty vegan food. (I'm not vegan.) We both scoff at the boring, old-school, plate of steamed veggies. She (and I) happily prepares non vegan food for family members who aren't vegan. I've never heard a snooty word spoken. True, my sampling size is minuscule. I'm not going to make sweeping assumptions. I have the distinct sense you are making sweeping assumptions though, qualifier notwithstanding. Where/how did you make these observations? Last edited by varwoche; 17th December 2018 at 01:14 PM. It's purely anecdotal. I should temper my assumptions. While there is lots of vegan virtue signaling (just google junk food vegan) on the internet, it's likely a case of the small fringe having the loudest voices. In the past few years, I have been trying to diversify my cooking skills and recipes. I find searching for vegetarian dishes to be more helpful than searching for Vegan dishes. Lots of vegan cooking advice tends to lead to the pseudo scientific woo I find so insufferable. This isn't unique to veganism though. Healthy eating culture is saturated with woo peddlers. Same with exercise and weight loss worlds. It's frustrating having to deal with all this nonsense. You start looking for a good recipe for black bean burgers and end up with a screed on why GMO food is the devil. Last edited by SuburbanTurkey; 17th December 2018 at 01:32 PM. I've been trying to heat healthier lately, mostly looking for low-fat, low-cholesterol, and low-sodium foods. Vegetarian options often provide much of that. I still eat some meat, but much less and more poultry or fish than red meats. That being said, it's hard to find vegetarian foods (or for that matter, even just healthier regular foods) pre-prepared that aren't "Organic" or "Non-GMO". I make a point to seek out the ones that aren't whenever possible. My opening post probably could've been phrased a little more carefully, even though I did mostly talk about a reduction of meat. Veganism is just a simple word though. The fact that it evokes such conotations is probably part of the problem. I completely agree that the goal should be a reduction in the use of animal products, not the adoption of full-blown veganism. But this doesn't really change the issue. In today's modern diet, meat, eggs and milk products are king, while vegetables are reduced to the role of side dishes. I don't think the difference between a low-meat diet and veganism really changes any of my points. I feel that the opposition to the idea is pretty much the same. The idea behind the OP is a red herring. Meat requires more land to produce than similar quantity of vegetable food, but the same s true of heirloom and organic vegetables. 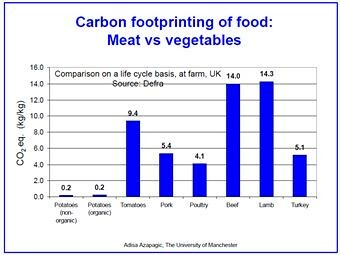 Even with these other factors removed there are still gong to be some vegetable foods with higher and lower carbon footprints, do we ban the ones with the higher footprint? Ultimately, while addressing climate change requires that we limit our CO2 emissions, by itself this tells us nothing about how we should allocate these limited emissions and we can still make different choices based on our individual priorities and tastes. We should not be taking our own preferences and insisting everyone else follow them. A meat tax? That would probably work to at least limit consumption. A carbon tax that reflects the carbon footprint of meat production would already do this. Care would be needed not to double count. Applying a carbon tax to the energy directed towards meat production would catch most of the Carbon footprint, but there would still be a land use footprint to consider. I'm surprised it took this long for someone to mention this. Sure meat consumption can have negative effects on the environment, but why stop there? If OP's goal is climate harm reduction shouldn't we look at all food and start eliminating ones that are bad for the planet? I have a few vegan friends and boy do they they love almonds and almond milk. Personally I'm not a big fan. Out of curiosity I googled vegan acceptable foods and these two items show up on every list. Also rice isn't that environmentally friendly either. If people stop eating meat chances are they will consume more of the above, so maybe we should eliminate these two items as well along with the meat. In fact, we should find the most climate friendly foods which at the same time supply us with the proper nutrients needed for survival and restrict our diet to those only. No nuts packed in plastic. Add Coffee and tea as well. All those Starbucks locations can't be good for the planet, time for those to go! How much environmental waste is created by manufacturing coffee makers, expresso machines and K-Cups anyway? Do we really need this stuff? Toasters, microwaves and blenders... are these really necessary? Like we need more stuff in our landfills?! Bye bye food packaged in plastic such as bottled water and other drinks, sauces, pasta, olive oil, salad dressings etc. I apologize if I missed anything, maybe OP can come up with a list of 10 or so food items that are acceptable for consumption and the best way to go about preparing them. We can then use this as a guide to save the planet. Not having children will do wonders too. Let's get on this! Thanks. By the way, I could have addressed that to many posts/posters, I didn't mean to pick you out. I did that because you impress me as reasonable. Yes, veganism, and health/diet in general, has its fair share of woo. Whether it comes to vegans, feminists -- any group for that matter -- we should all be careful not to judge the entire group (which you didn't do) by the extreme examples that are sometimes cited in threads. When I read "the vegans I see don't look healthy..." I wonder how many vegans the poster has seen, how they know they are vegans, etc. I suspect these comments might be based on scant observations, meanwhile not noticing healthy looking vegans. Last edited by varwoche; 19th December 2018 at 04:57 AM. I was slightly surprised to see the chart upthread showing that tomatoes aren't very green. I can easily imagine the factors, e.g. yield. Why is that true of organic vegetables? (Is it true?) Yield? Organic fertilizers score worse than non-organic? Last edited by varwoche; 19th December 2018 at 05:07 AM. Chart upthread showing tomatoes with a high carbon footprint is largely due to UK tomatoes being grown in greenhouses, which consume large amounts of energy. If people imported from warmer climes, the footprint would shrink. Interesting. I suppose these are climate controlled greenhouses. And I suppose the quality/yield justifies the energy use for the farmer. Of course, a passive greenhouse/hoop house doesn't consume energy, other than what was required to manufacture it. Tell the Brits to use more of those! Lower yield increases the land use footprint, and land use changes are the second biggest contributor to global warming after fossil fuel use. FWIW a lot of the CO2 footprint associated with meat is a result of using fossil fuels to intensify plant production, which is then fed to animals instead of consumed directly. Using different production methods like raising free-range animals on marginal or difficult to farm land would probably remove a lot of the CO2. There would still be land use changes though. Wouldn't that also reduce food production and increase food costs? Getting rid of land fills, sewage systems, etc and letting people dispose of their waste anywhere would be cheaper but it wouldn’t really cost less. Costs would just be pushed costs onto someone else but they would still be there. If you are selling something where you don’t need to pay for all the costs involved it may lower the cost but it isn’t cheaper. Including these costs instead of having someone else subsidise them, will increase the price but doesn’t make them more expensive. Just the opposite in fact. If all costs need to be included in the piecing the free market can kick in an optimize the costs for you, the subsidised version will invariably be less efficient and more expensive in the long run. Yeah, I'd like to find a decent vegan cookbook that focuses on the food itself rather loudly proclaiming why veganism is so great. I just want to make some vegetable dishes because I like vegetables, OK? And if it tells me how to make a bean/barley/pecan burger as good as the one I had in Ithaca, that's a plus. And that's the best thing we can do long term. The population of the planet has tripled in my lifetime, and doesn't look likely to stop any time soon. Cutting back X% on one-use plastics, etc helps, reducing meat consumption helps, as does everything else you mentioned, but we need to stop the population from growing exponentially.